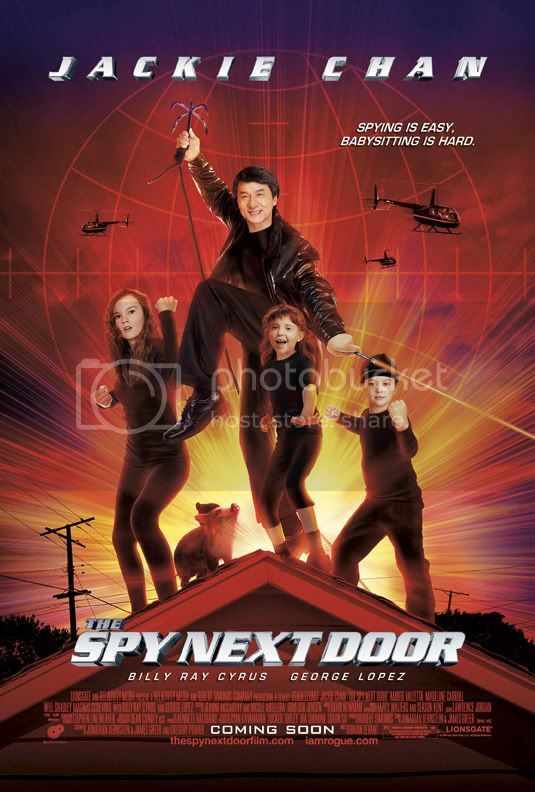 The Spy Next Door is a children’s film, an important fact to remember when attempting to review it. It is not a good children’s film, however, nor is it a good film by any definition of the word. My advice would be to take the young ones to go see Where the Wild Things Are [review here] or Fantastic Mr. Fox [review here] in the dollar theater instead. They can find this drivel on Saturday morning television shows; there is no need to go to the theater for a movie this poorly made. Jackie Chan provides the only hook that might be of interest to audiences. Unfortunately, this is definitely the worst Jackie Chan movie I have ever seen, worse even than Fantasy Mission Force. He manages to retain some of his trademark charm, and some of the action sequences are mildly enjoyable, but this is a low step for the venerable action and comedy star. The ridiculous plot is the beginning of the inanity. Chan stars as Bob Ho. He lives in a wealthy suburb and purports to be a pen salesman. He has struck up a romantic relationship with the pretty young mother next door, Gillian (Amber Valletta). Her husband left her with three young children, yet she somehow manages to pay the bills and expensive mortgage with her paintings. The problem is that Ho is not really a pen salesman, and not nearly as boring as his public demeanor might suggest. Secretly, he is an international spy, on loan to the U.S. from Hong Kong. He works with his superior, Glaze (George Lopez), and his partner Colton (Billy Ray Cyrus) as they attempt to apprehend a dangerous Russian terrorist. The more difficult part of his life involves Gillian and her children. They are convinced he is a dreadfully boring person and can’t see why their mother would want to date someone like that. When she is suddenly called out of town for a few days, Ho offers to babysit in an attempt to strengthen his bond with the kids. The rest of the film is plainly evident, as the whole gang gets caught up with the Russian terrorists. Along the way they learn to appreciate each other, as one might expect. It is not only the ridiculous plot that is a detriment to the film; other children’s films have had sillier plots and still been more enjoyable. The production is poor, from the directing and editing to the dialogue. 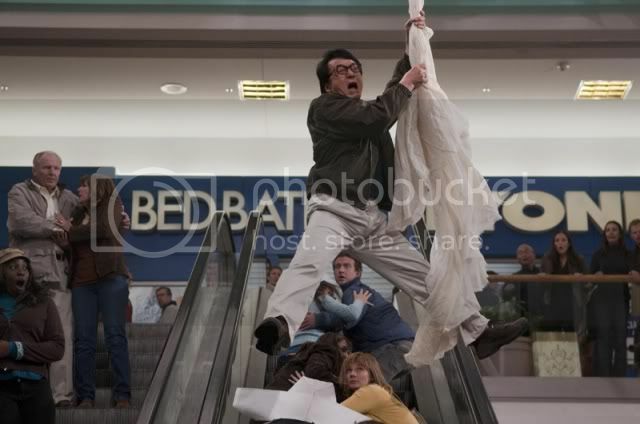 Some of the action scenes are lackluster, and the hammy acting doesn’t help. The children are all hollow stereotypes: the moody, rebellious pre-teen, the nerdy, intelligent ten-year old boy, and the adorable, trusting kindergartner. All of this I could have endured had the requisite closing credits been enjoyable. Unfortunately, Chan’s moment to truly shine is also quite poorly executed. The first few jokes about his hatred of the English language are amusing and true, but the rest of the material is stale. Most of the negative comments I’ve leveled at the film become mute when we recollect that this is a children’s film. Director Brian Levant is no stranger to children’s films, having made Beethoven, a personal favorite of my childhood, and another film with an action star, Jingle All the Way [review here]. He is also responsible for The Flinstones films and a few other kid-only movies. I will admit that I imagine a fair number of children will enjoy the picture. The problem, however, is twofold. To begin with, their parent’s will not enjoy it. Secondly, there are far superior films for parents to watch with their children. Teach them what makes a good movie; watch any of the Pixar movies, the better Dreamworks endevours, and classic Disney films. I will admit that quality live-action children’s fare has been rare, though that fact makes it more important to search out films like the aforementioned Where the Wild Things Are. Regardless, I would rather watch a documentary about Chan’s teacup collection than sit through this again. This entry was posted in 0.5 pirate flags, 1.5 stars, Movie Reviews, S on January 16, 2010 by Tim Irwin. i really like jackie chan.. All his movies are very much interesting.. I already watch the trailer of the spy next door and it was really funny..i will watch for this..